RFID-based "dog tags" may help troops identify each other in the field. The unit is small enough to be carried; the RFID (radio frequency identification) transpoder will be able to communicate information as well as position. These systems are intended to allow a shooter to query his target - "friend or foe?" - and have the target respond if friendly, reducing friendly fire incidents. Actual dog tags (the metal ones) were first handed out to troops in 1906. The idea of a digital dog tag has also been around for a while. Inventor Hal Woodward impressed the DoD with a small, hardened device that could hold a soldier's medical history for quick access in the field in 1996. This convinced the Pentagon to start the Personal Information Carrier (PIC) project. RFID would allow the tag to be scanned most conveniently. 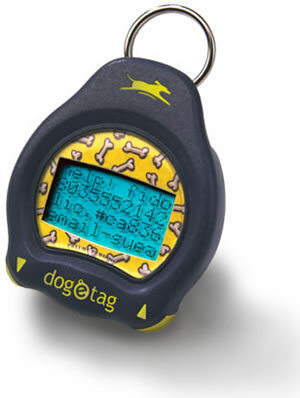 On a lighter note, this article would not be complete without mentioning that the idea of the "digital dog tag" has already been implemented for canines; the Dog-e-Tag contains up to forty lines of information to store the owner's pager number, veterinary information and even messages like "I like my tummy rubbed." SF fans may recall the holo, a kind of driver's license from Alexander Besher's 1994 novel Rim. Read the reference story at Friend or Foe? A Digital Dog Tag Answers; find out more about the PIC program at Digital Dog Tag Invention Inspires DoD.